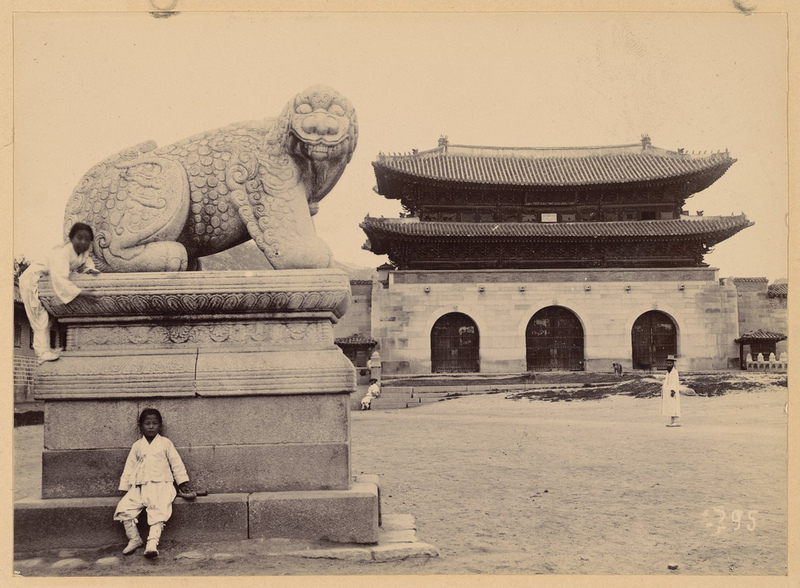 Description: The South Gate of ‘Kyongbokkung’ (Kyongbok Palace) is seen prior to annexation when it was moved to make way for the new capitol. One of the twin haetae (fire-eating monsters) which protected the palaces from fire is depicted here in front of the reconstructed gate. Source: Adams, Edward B. Palaces of Seoul : Yi Dynasty palaces in Korea’s capital city, 1972. P. 172. There are no known U.S. copyright restrictions on this image. The digital file is owned by the Cornell University Library which is making it freely available with the request that, when possible, the Library be credited as its source.